During November 2012 Annemarie Swainson, head of Harris & Harris Solicitors Wills and Probate Department and Joshua Eva, an Associate in that department, raised an estimated total of £1,345 by participating in Will Aid, the UK’s leading charity will-writing scheme. Will Aid offers an opportunity to make or update a Will in return for a donation to help people in need in the UK and all over the world and supports nine well-known UK charities: ActionAid, Age UK, British Red Cross, Christian Aid, NSPCC, Save the Children, Sightsavers, SCIAF (Scotland) and Trocaire (Northern Ireland). 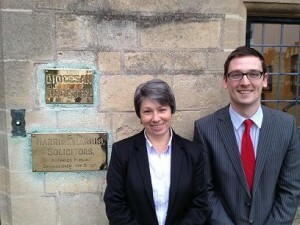 As part of the Will Aid campaign Harris & Harris drew up basic Wills for local people without charging their usual fee. In return for this service the clients made a donation to Will Aid. This year saw a very busy and successful campaign during which 15 Wills were made for local people, giving their families the security of a properly drafted Will as well as the opportunity to support popular charities. The money raised by Harris & Harris will be added to the nation-wide total, currently standing at £1.5m, which will be put to work to make a real and lasting difference to vulnerable children, families and older people in the UK and around the world.